Emile A Gruppe, American. 1896-1978. ​​​​​​Born in Rochester, New York, Emile Gruppe became a renowned New England landscape and marine painter. Although he is best known for his variety of Impressionistic landscapes, he also painted figures and portraits. His modern style was largely inherited from French Impressionist Claude Monet. "Lily Pads", date and location unknown, one of Gruppes landscapes, attests to Monets influence and is similar to some of the paintings in Monets "Water Lily" series. Emile was the son of renowned landscape artist Charles Paul Gruppe, who was recognized by the Dutch as being one of America's most gifted painters of the late 19th Century. 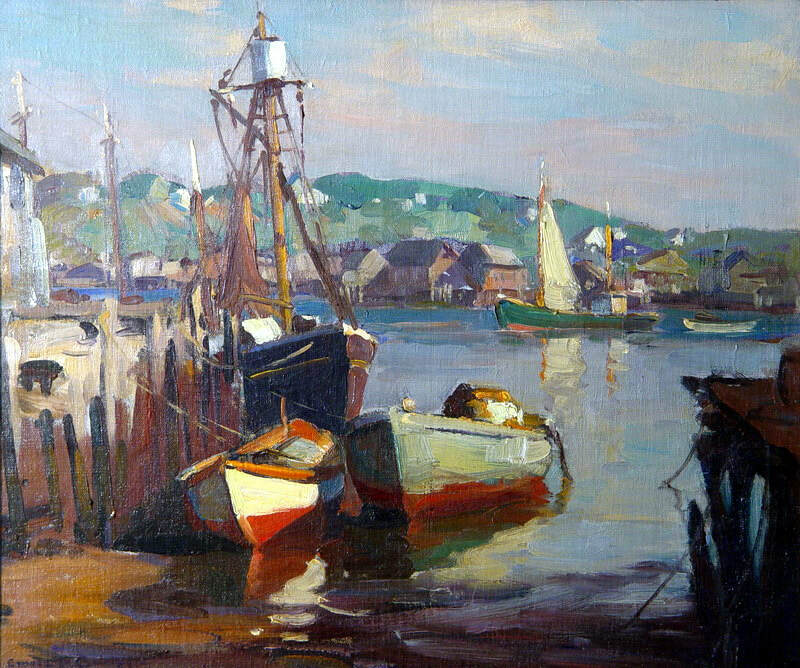 In 1925, after seeing a number of Rockport and Gloucester harborscenes painted by Frederick Mulhaupt at an exhibition in New York, father and son traveled to the Cape Ann area of Massachusetts. They fell in love with the location, set up studios and painted there for the rest of their lives. Emile had a very strong art background and received his initial training from his father before being educated in art at The Hague in the Netherlands and in New York City at the National Academy of Design and The Arts Students League. He also received instruction from artists George Bridgeman, Charles Chapman, Richard Miller and John F. Carlson, with whom he later founded, in 1942, the Gruppe Summer School in Gloucester, Massachusetts. Gruppe painted numerous works throughout his life. He is best known for his impressionistic landscapes, painted figures and portraits - especially for "his views of fishing boats docked at Gloucester and Rockport, and for his Rockport village scenes." For the majority of his professional career, he worked and lived in Gloucester, Massachusetts, often wintering in Vermont and Florida.